On Monday the Parliament was re-opened for a new session by the Governor-General. By the end of the day the ABCC Bills had been voted on by the Senate and the Government lost the vote 36-34. This means these Bills are now double dissolution triggers. A trigger Bill is one that originates in the House and is twice rejected by the Senate at least three months apart. On Tuesday the Prime Minister re-announced that he expects a double dissolution election on 2 July. But of course there are a couple more hurdles to jump before that can occur. One possible issue is the High Court challenge that Senator Bob Day has established to test the constitutionality of the changes to the Senate voting method. This case will be heard by the full bench on 2 and 3 of May, but it is unclear when the result of this case will be announced. If the High Court decides that the new election method is unconstitutional, a double dissolution election may start to look unappealing for the Government. The other hurdle is the budget that will be handed down on 3 May. The appropriations Bills will need to be passed by both Houses of Parliament before the double dissolution cut-off date of 11 May. Then the Prime Minister will need to travel to Government House and request that the Governor-General dissolve both Houses of Parliament. How does a double dissolution work? There are many scenarios that can result from a double dissolution as it is a several step process. It is outlined in Section 57 of the Constitution. This is how it most commentators expect it will unfold. On 11 May the Governor-General will dissolve both Houses and Parliament, writs will be issued for a 2 July election. All Senate seats will be up for election, this being 12 in each State and two in each of the internal Territories. And like a normal election all of the seats in the House will be decided by the voters. The first thing that the Government would need is to gain a majority result in the House to be returned to Government. If they gain a majority in the Senate, the trigger Bills will be passed in the normal fashion, one House at a time. If the Government is returned without a Senate majority (but an overall majority over both houses) they will first attempt to pass the trigger Bills in the normal way. If the Senate rejects them, the Governor-General may convene a joint-sitting of the two Houses, where together they will deliberate and vote on the Bills. For the vote to carry it must be affirmed by an absolute majority. This means more than 50% of all Members and Senators, not just the ones present at the vote. As you can see, there are a lot of moving parts. The Government could lose the election. Of the six double dissolutions that have been held since federation in 1901, the Government has lost power three times. We could end up with a minority Government in both Houses, the Government might get a majority in the House and a minority in the Senate with not enough seats to pass the Bills in a joint sitting, etc. The first double dissolution was in 1914 and was held after a similar situation to the current one. Let’s have a closer look. The May 1913 federal election resulted in Labor being voted out of office and the Commonwealth Liberal Party, led by Joseph Cook, winning. The new Government only had a majority of one in the House of Representatives and relied on the vote of the Speaker to pass Bills through this House. The half-Senate results at this election saw the new Government end up with only seven Senate seats, while the Labor Opposition had the remaining 29 seats. As you can imagine, with the Opposition holding a very large majority in the Senate, it was impossible for the Government to pass legislation. On Wednesday 11 March 1914, the Prime Minister requested that the Governor-General prorogue Parliament until 15 April and force the Senate to return to vote a second time on two potential double dissolution trigger Bills. At the meeting of the Federal Executive Council yesterday a proclamation was issued further proroguing the Federal Parliament until Wednesday, April 15, on which date it is to meet for the transaction of Business. The session will be opened by His Excellency the Governor-General with the usual ceremony. This will be the last occasion upon which Lord Denman will meet Parliament, and an additional interest will attach to the proceedings on this account. It is not expected that the Governor-General's Speech will be a long one. Reference will of course be made to the two test measures which "failed to pass" last session, and there will also be other matters of urgent interest in the Government programme. The two test measures are the bills to restore the postal vote and to abolish preference to unionists in Government employ. The Ministry, is understood to be determined to pass these two bills at all hazards, and failing their ability to put them through the Senate they intend to ask the Governor-General for a double dissolution, as provided for in the Constitution when measures passed by the House of Representatives have failed to find acceptance in the Senate in two succeeding sessions. So the Prime Minister prorogued Parliament to get the Senate that he didn’t control back to vote on legislation about unions and if they didn’t pass it, he threatened to call a double dissolution election. Sound familiar? What happened when Parliament was returned on 15 April 1914? The exigencies of public affairs have caused me to summon you to resume your deliberations earlier than usual…. During the first session of this Parliament, my Ministers, for reasons which they advise me were beyond their control, were unable to pass legislation on many subjects….Those subjects comprised Bills dealing with the prohibition of preference or favouritism in Government employment….These measures failed to pass, and it is intended to make a further effort to pass them in the short session now commencing…. I need scarcely recall the fact that when the people of Australia decided to federate, they did not act hastily. After many years of discussion, and after the public had been educated through the press up to an understanding of all that Federation meant, a popular Convention was elected for the purpose of framing a Federal Constitution. The very best intellects that Australia could produce were represented on that Convention, and, as the result of its deliberations, our present Constitution was finally adopted….I need hardly remind honourable senators that the most eminent constitutional authorities - men who spent their lives in studying constitutional history - have spoken of our Constitution as the best and most perfect instrument of government ever devised by the brain of man…. ….The framers of our Constitution embodied in it certain provisions for the purpose of coping with deadlocks. It is strange that in no other Federal Constitution does any such provision appear. It is strange, too, that after an experience of a hundred years the American Federation - which embraces some forty odd States - has never been faced with a similar position to that in which we find ourselves to-day…. ….In this Chamber we have twenty-nine Labour representatives as against seven Liberals. When our Constitution was framed, the idea underlying the creation of the Senate was that it should represent the States, and the States alone…. ….It is perfectly honourable for the Liberal Prime Minister to say that the experience of last session has convinced him that he cannot carry through Parliament the Bills which he was elected to carry, and that, therefore, he proposes to send up to this Chamber two test measures for the purpose of bringing about the position which is contemplated in the Constitution, and which will permit of the electors settling the deadlock…. ….When we see that no parliamentary work can be carried on by the Cook Government because of the hostile majority in the Senate, we have a perfect right to go to the electors and tell them that we want them to alter the position…. The following month the union Bill was rejected by the Senate a second time and the new Governor-General had arrived. The Prime Minister visited the new Governor-General, Ronald Munro Ferguson to request a double dissolution, however it took some time for Joseph Cook to persuade him to agree. Australia was a young democracy with a brand new Constitution that provided a unique section to break a deadlock between the Houses. Ronald Munro Ferguson was quite familiar with politics in the UK, but as he was new to Australia needed to be convinced that a double dissolution was the best option. As this was the first time section 57 was employed, he also needed to make a decision as to whether he as the Governor-General had any discretion in the matter or whether he must act on the advice of his Prime Minister. He sought advice from High Court Justices, who had been involved in the drafting of the Constitution and a former Australian Prime Minister George Reid. The High Court suggested that the Governor-General could not act without the advice of his Ministers, but he was not bound to follow their advice and dissolve both Houses of Parliament. Eventually the Parliament was dissolved on 30 July 1914. However, around this time World War I broke out in Europe. The election was held on 5 September 1914 and as they say, events beyond the control of Government can help win or lose elections? The first-term Joseph Cook Liberal Government lost the election to the Andrew Fisher Labor Government, who received a majority in both Houses. This was Fisher’s third stint as Prime Minister. Back then we had a first past-the-post election system, which could result in the massive majorities in the Senate. The 1914 Fisher Government won 31 of the 36 Senate spots (The new 2016 Senate voting rules are taking us back towards a first past-the-post voting system). The loss of Government at this election meant that the union Bill was dead and the joint sitting was not held. 102 years later, in 2016, the polls are neck and neck. 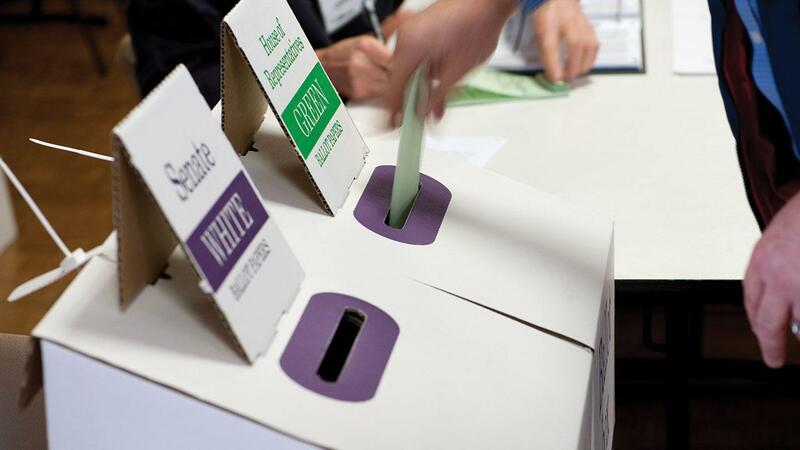 It could be up to the electors of Australia to settle the current deadlock in the Parliament at a double dissolution election that is expected to be held on 2 July.